It really is full Summer now, in fact it is starting to feel close to the start of Autumn. The Lammas growth is starting to show on many of our trees, the rowan berries are ripe and the young birds have fledged and left their nests. The school holidays are upon us and the Wellington Rocks are covered with children and the surrounding grass is hosting many a picnic. The canine users of the Common thoroughly approve of this practise and are always happy to join in, so remember to be vigilant and hang on to your sandwiches! Other signs of the advancing season are the increasing gaps we are able to leave between cuts of the grass, as our sandy soils dry out, and the appearance of the flail cutters, who are now underway clearing the main paths and edges of the Commons. The big machine has finished it’s initial cut now but will be back in September to clear the main areas of long grass, the small flail will continue working throughout August, clearing the minor tracks and paths through the woodland as well as tidying the areas around the perimeter that the main flail is too big to get into. 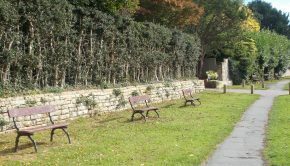 We have now finished this year’s programme of bench renovation, with twenty five of them being cleaned and re-painted and we will soon be turning our attention to posts and barriers. After our recent problems on the Lower Cricket Pitch, we have brought in some more large tree trunks to protect the boundary and these will be dug in over the next few weeks. We will also be carrying out some work on our drainage system to make sure that water coming off the Common is directed into the storm drains on Major York’s Rd but this will only work if KCC co-operates, as currently the storm drains and gullies on the highway are completely silted up. Whilst we were investigating the drainage issues, we discovered three huge soakaways alongside Major York’s Rd that are clearly designed to take excess water in times of heavy rain. Again, because the road drains are blocked, these soakaways are doing absolutely nothing to help alleviate the problems at the Pantiles, as was clearly the intention when they were constructed. We have alerted Highways to this issue, so hopefully the storm drains will be sorted before the wet weather starts again and maybe the Pantiles won’t get flooded so often this Winter. 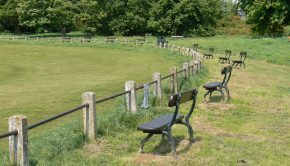 On the subject of problems with water, we have for the past couple of years had issues at the junction of Lower Green Rd and Rusthall Rd, where an area of the grass has become waterlogged and we have been unable to mow it. There has been much investigation to try and work out where this water is coming from but we still have no idea. We had been looking at the possibility of putting in an extensive and expensive drainage system to try and dry out the area. However, following a suggestion from a member of the Parish Council, we have decided to instead leave the site as a wet area and make a benefit of the problem by encouraging wetland plants there. We will have to cut and clear the area occasionally to stop willows and alders taking over but I thought it a great suggestion and I must admit that the area looks quite nice already.